Count Ferdinand von Zeppelin began construction of his first airship, LZ-1, in June, 1898 in a floating wooden hangar on the Bodensee (Lake Constance) at Manzell (Friedrichshafen) in Southern Germany, not far from the Swiss border. The movable, floating shed allowed the ship to be positioned into the wind to enter or leave its hangar. The ship was completed in the winter of 1899 but von Zeppelin decided to wait until the summer of 1900 before attempting to fly his invention. The ship was inflated with hydrogen gas in June and made its maiden flight on July 2, 1900. The first flight lasted about 18 minutes and covered about 3-1/2 miles over the lake. Attempts were made to increase the rigidity of the framework and address the other problems, and two additional flights were made, but the flights did not impress the military representatives in attendance that Zeppelin’s project deserved public funds, and Count Zeppelin was out of money. Zeppelin was forced to dismantle LZ-1. But while LZ-1 itself was not a success, Count von Zeppelin’s basic concept — of a long rigid metal frame containing individual gas cells and covered by fabric — was sound, and formed the basis for all future zeppelin airships. Count Zeppelin’s second ship, LZ-2, was not built until five years later, with funds raised partly from a lottery approved as a favor by the King of Wurttemberg, and partly by the mortgage of Countess Zeppelin’s family estates. LZ-2. The stronger, more rigid frame provided by Ludwig Dürr’s triangular girders can be seen, but the ship still lacked fins for stability or control. While an improvement over LZ-1, Count Zeppelin’s second ship still did not incorporate basic design elements which would later be recognized as essential to flight stability and control, such as vertical and horizontal stabilizers and control surfaces. But LZ-2 did represent a significant technical advance due largely to engineer Ludwig Dürr; the weak tubular girders of LZ-1 were replaced by triangular girders (visible in photo above), which provided dramatically improved rigidity and strength. Triangular girders similar to those used on LZ-2 would be used on every subsequent zeppelin airship, and Ludwig Dürr would remain as chief engineer, designing every ship built by the Zeppelin Company after LZ-2. LZ-2 made its only flight on January 17, 1906. Zeppelin had replaced the 14 hp engines used on LZ-1 with 80 hp Daimler engines, which gave LZ-2 sufficient speed to maneuver in light winds, but engine failure forced an emergency landing during the ship’s very first flight, and it was destroyed on the ground by a storm that evening. The next two ships, LZ-3 and LZ-4, were even greater advances in technology, with huge increases in controllability, power, speed, range, and payload. Large horizontal fins and elevators finally provided greater pitch control and stability, and the ships were capable of producing aerodynamic lift. Longer and more reliable flights became possible; in 1907, LZ-3 made a flight of 8 hours, and on July 1, 1908, LZ-4 made a flight of 12 hours over Switzerland. The record-breaking Switzerland flight of LZ-4 brought national attention to the success of Count Zeppelin and his machine, and the public began to look on the airship as a practical innovation. On July 3, 1908, King Wilhelm II of Wurttemberg and his wife, Queen Charlotte, were passengers on the fifth flight of LZ-4. 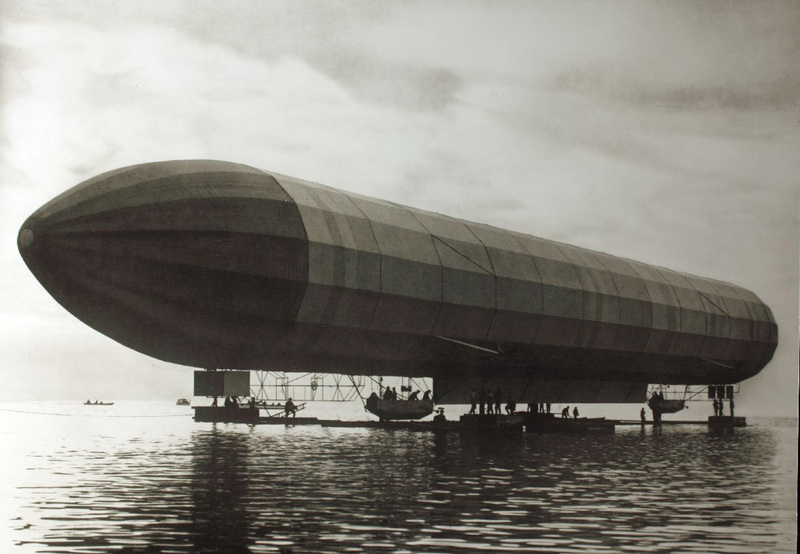 The German government promised financial support for Count Zeppelin’s efforts if his ship could make an endurance flight of 24 hours, and confidant in his ship’s ability, Zeppelin agreed to the challenge. LZ-4 departed the Bodensee on August 4, 1908, for a 24-hour trial. LZ-4 leaving its hangar on the Bodensee for the 24 hour test flight that ended at Echterdingen. Just as it seemed that Count Zeppelin and his team had mastered the basics of airship design and operation, LZ-4 was forced to make an emergency landing in a field at the town of Echterdingen on August 5, 1908, during the 24-hour endurance flight. Pulled by a sudden storm from its temporary mooring, the ship crashed and was soon destroyed by a fiery explosion of hydrogen. In response to the crash, rather than lose faith in Count Zeppelin’s work, the German public rallied behind Zeppelin’s efforts; in what became known as the “Miracle at Echterdingen,” Germans contributed 6 million marks for the construction of a new airship and gave new life to the zeppelin enterprise. The fervent financial and political support of the German public and government following the crash at Echterdingen allowed the Count to establish the Luftschiffbau Zeppelin (Zeppelin Construction Company) in September, 1908. Alfred Colsman was the Zeppelin Company’s business manager, and in 1909, journalist Hugo Eckener joined as the company’s director of public relations; within 2 years, Eckener would be an airship commander. Colsman would shortly establish DELAG, the Deutsche Luftschiffahrts-Aktiengesellschaft (German Airship Transportation Corporation Ltd) as a affiliate of the Zeppelin Company, to commercialize zeppelin travel by providing passenger service. Early zeppelin under construction at floating hangar on the Bodensee. I grew up in the Bay Area, California, and could see Moffet Field from my house, though I never saw an airship, but that huge hanger started my love for airships. Really great site, thanks! I’m interested to know more about the floating hangar at Friedrichshafen, if anybody knows. In particular, a date for its construction (1899? 1900?) and the external cladding material on roof and walls: wood, metal, other? would love to hear more about your grandfather. i interviewed a ww1 guy in 2007, age 105. he was the last living survivor in the entire usa. lived to be 110. call me sometime. my cell # is 704-254-0859. hope to hear from you. did you have chance to explore the David Schwarz story about him selling his airship designs to graf von Zeppelin? Thanks, this is quite valuable information I believe. How did you manage to dig it out and verify?